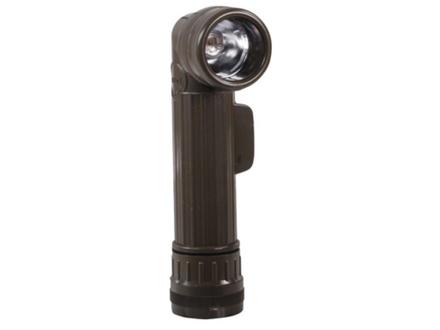 These GI Anglehead Flashlights are made to US military specifications by a government contractor. They are an inexpensive, waterproof angle head flashlight that uses two D-cell batteries. 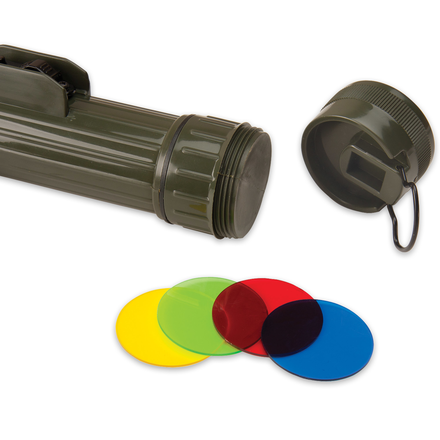 It uses a standard incandescent bulb, and features a high-impact plastic body, a belt/equipment clip so that it may be fastened to a belt or strap, a tail cap lanyard ring, a multi-mode switch and tail cap with a storage compartment which houses multiple colored plastic lenses.